Three other sons of Walter were at Ballon. 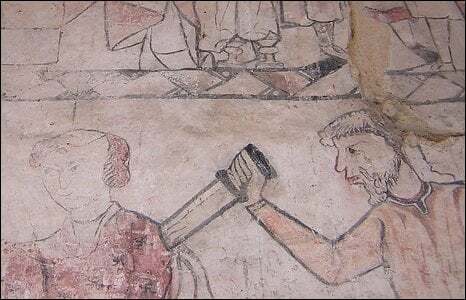 When they head of the violent death of their father and brothers they were greatly angered and broke violently into the prison, where they inflicted a miserable death on Robert of Belleme by shattering his head with axes. Richard Barton, Associate Professor of History at the University of North Carolina, Greensboro, asks what does Orderic Vitalis mean when he says something is violent. This twelfth-century Anglo-Norman historian reported on many incidents that we would consider violent – battles, sieges, attacks – and in his work the Ecclesiastical History he writes the word violentia (or versions of it) eighty-two times. However, Barton points out that when Orderic writes that something happened violently, it was because he was expressing a judgment on whether or not this was a legitimate use of force. In the previous excerpt, Orderic Vitalis is condemning the murder of Walter of Sol and the breaking into the cell as unjust, but he does not use that term to describe the killing of Robert – in his mind this action was considered a legitimate form of revenge killing, and therefore not violent. Barton explains that when the Anglo-Norman writer states something is violent, it almost always means that he considers it to be inherently unjust. For example, he makes use of it when a new abbot is imposed on a monastic community – an act that a modern reader would not view as violent. Meanwhile, the word for force – vis – is used 185 times in the Ecclesiastical History, and Barton finds that his use of the term is quite broad. It can just mean strong in some instances, and does not carry the connotation that the action was just or unjust.